(3 p.m. BST) -- Channel 5 has confirmed a third series of its hugely popular show, 'Cruising with Jane McDonald'. Channel 5 has not said when the series will air or on which ships Jane will cruise. The first series was a huge hit for the network -- receiving average viewing figures of 1.8 million per episode -- prompting Channel 5 to immediately commission the second series, which was filmed this summer. As in the first series, Jane went on four different ships: Viking Sky, MSC Meraviglia, Avalon Poetry II and Celestyal Crystal, visiting the Baltic, the Med, the Rhine River and Cuba. Commenting on the Cuba cruise, she said: "Cuba was like being in the film La La Land. Everywhere we went people were singing and there were bands on every street corner. I was serenaded with guitars. Cubans are the happiest people I've ever met, and it was really enlightening to be with folk who love life. We blagged our way into a house party and it was like the set of Fame." Also, as in the first series, cruise lines saw huge increases in enquiries and bookings as a result of the show. 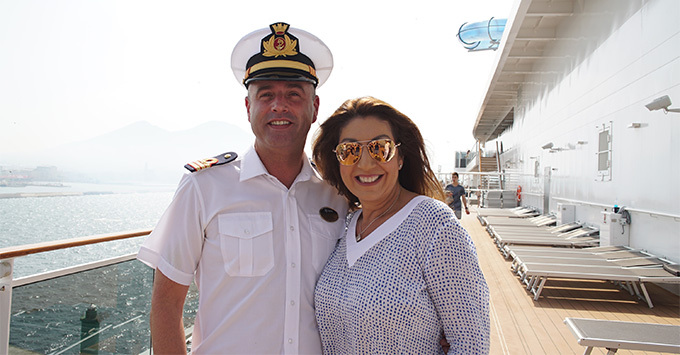 Antonio Paradiso, MD of MSC Cruises for the UK & Ireland said "We were delighted to feature in series two of "Cruising with Jane McDonald" and we are so pleased with the overwhelmingly positive response from both consumers and trade on the MSC Cruises episode. The response on social media was great with so many people stating how the episode had broken-down stereotypes about the industry and showed cruising to be an accessible and fun holiday for people of all ages. "We saw a real increase in traffic to the website which received three times the number of visitors than is usual for a Friday evening. This was supported by additional enquiries to our contact centre and an uplift in bookings through our trade partners." Neil Barclay, Head of Sales at Viking Cruises said: "We were delighted to feature in the first episode of series 2, Cruising with Jane McDonald – we hope it showcased the beauty of the Baltic and our stylish ship, Viking Sky. The response to the programme has been extremely positive and our dedicated ocean team continue to deal with a high level of enquiries." Giles Hawke, Avalon's UK Managing Director commented: "We're delighted Channel 5 chose to film such a beautiful area as Burgundy and Provence, sailing the River Rhône on board Avalon's Suite Ship, Avalon Poetry II. The first series generated huge interest around the cruises it featured, and I'm sure the second series will have the same effect." And Kyriakos Anastassiadis, CEO of Celestyal Cruises and CLIA Europe Chairman commented: "We are honored to be part of this series and to have had the opportunity to host Jane, who is of course synonymous with cruising in the UK. Cruising continues to grow in popularity in the UK and we hope that this series will generate further interest in cruising and Celestyal Cruises."